1. They are called spider monkeys because they look like spiders when they are suspended by their tails. 2. Spider monkeys inhabit evergreen rainforests, semi deciduous and mangrove forests, preferring undisturbed high forest. Spider monkeys are primarily arboreal and rarely come to the ground. 3. This monkey's most distinctive physical feature is a long, prehensile tail that functions as a fifth limb. 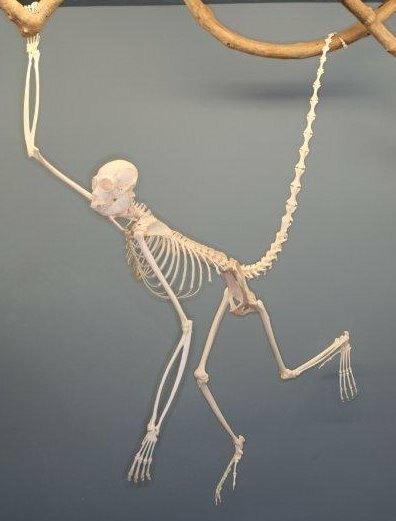 The spider monkey reputedly has the strongest and most agile prehensile tail of any mammal on earth. 4. Their arms are long and muscular, as are their fingers. Strangely, they have no thumbs. An X-ray of their hands reveals a mere vestige of the thumb bones. All these features are adaptations to their lifestyle of swinging from branch to branch and tree to tree in search of forest fruit, their principal diet. 5. Both the underside and tip of the tail are used for climbing and grasping and so the spider monkey uses it like a fifth hand. When swinging by the tail, the hands are free to gather food. 6. Spider monkeys have been called "the supreme acrobat of the forest." In the wild, the Spider monkey rarely comes down to the jungle floor. Acrobatic and swift, Spider monkeys move through the trees, with one arm stride covering up to 40 feet. 7. Spider monkeys live in groups, called troops, of 10 to 30 individuals. The males are dominant. 8. Spider monkeys communicate with various vocalizations including territorial “barks.” They are easily excitable and will shake branches and throw fruit at intruders. 9. Spider monkeys are fruigivorous, preferring a diet of 90% fruit and seeds, feeding on the mature soft parts of a wide variety of fruits in which the seeds are swallowed along with the fruit. They also eat young leaves, flowers, aerial roots, sometimes bark and decaying wood, as well as honey. 10. Acrobatic and swift, Spider monkeys move through the trees, with one arm stride covering up to 40 feet. 11. Like all other monkeys, the spider monkey is a primate and has hands that can grasp and eyes that face front. This is because they are tree climbers. 12. They've got great intelligence, and they seem to be able to make maps in their heads! Yep! that is how they can remember the location of specific fruit trees and where they are at in the jungle! 13. Then they make a HUGE leap! They sprawl out, just like spiders! 14. In addition to those crazy arms, spider monkeys have incredible vision. It's supposedly binocular-like! They can see super far away and with tons of detail! 15. One thing that is pretty sad about spider monkeys is that they can very easily contract a disease called malaria. 16. This pattern of one large troop and changing small groups is special to spider monkeys. It is called a “fission-fusion” (FISH-un-FEWSH-un) social structure. Sometimes the monkeys break up into small groups (fission). Sometimes they come together in one mass (fusion). 17. Spider monkeys are diurnal and sleep at night in trees tall enough that the top is free from the canopy. New Diet Taps into Revolutionary Plan to Help Dieters Get Rid Of 12-23 Pounds in Just 21 Days!